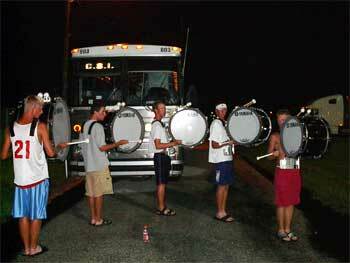 Bobby Marino, who marched in 2003 for the fourth time in the Cadets' bass line, sent this one in. "This is a picture of our warmup for our quarterfinals performance (in Orlando)! We didn't warm up in our uniforms in case it was to rain again. It was a very bizarre night, with all the delays and warming up in these clothes, but we had a great a show and semis and finals were even better. The bass players' names, from top to bottom, are: Joe, Bobby, Sean, Kyle,and Jake. It was a great summer and I can't wait to do it one last time." Thanks Bobby! E-mail your Forzato submissions -- and we will get to them all, in time -- to dave@dci.org along with where and when the photo was taken. Send some biographical information about yourself as well. We'll give you full credit. Also, let us know if you want your e-mail address included, to get feedback from other drum corps fans.